Preface: Thank goodness for the standardisation of the Xbox 360 controller for PC over the last few years. I couldn't even attempt a game like this without analogue control these days. I remember playing so much of the Domark F1 game on the Sega Master System back in the day. That game probably didn't need much subtlety in control though. Control felt detached and lagy. Tried reducing game resolution to bump up frame rate but nothing changed. Not sure if this is just a reflection of the handling model or whether there was something introducing extra lag into my setup. Using 360 controller which was natively detected and supported so that shouldn't be to blame. Although controller was supported, the on screen key mapping prompts don't reflect this choice. Even though they have nicely remapped menu navigation through the controller buttons you need to figure it all out by trial and error. The Shift series has advertised and emphasised the in car driver helmet perspective camera. 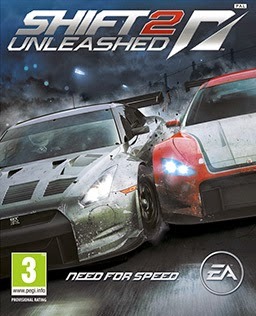 In car views have been common in racing games for a few years now but the Shift series tried to stand out by introducing fancy effects to mimic the motion and forces on the driver's head as opposed to a fixed camera placed within a car. I stuck with the default in car view for this reason and could see some of these effects in play when hitting a wall etc, but it didn't do much for me. Responsive controls meant I was already a bit detached from the experience and so this sort of immersion wasn't adding anything. Overall it came across as a competent game, maybe a little generic. I dislike the dude bro presentation and prefer a more restrained/slick approach of the Forza or Project Gotham (RIP) series.